Looking for an exciting career opportunity that provides a professional challenge, a flexible schedule, and great benefits? Join B.E. Smith’s extensive network of Interim Leaders, and take your career to the next level. Advance your career with B.E. Smith. From the C-suite to the surgical suite, we are your source for leadership opportunities. We’ve helped over 3,000 healthcare executives with their careers. We are ready to help you, too. Do you have the skills healthcare providers are searching for? If you are a physician executive, or specialize in finance, surgery, or post-acute services, you’re in the right place. B.E. Smith has the career opportunities you are looking for. “Every new assignment is an adventure as a B.E. Smith interim leader. It's been the best experience of my entire career and I don't think I could have done it the way I was able to do it without the support of B.E. Smith." The interim leader was a perfect addition during a difficult time of transition. The level of expertise, style, communication, and cultural fit made a tough situation tolerable. B.E. Smith truly delivered a quality individual to help us restructure and regain acceptable operational parameters. 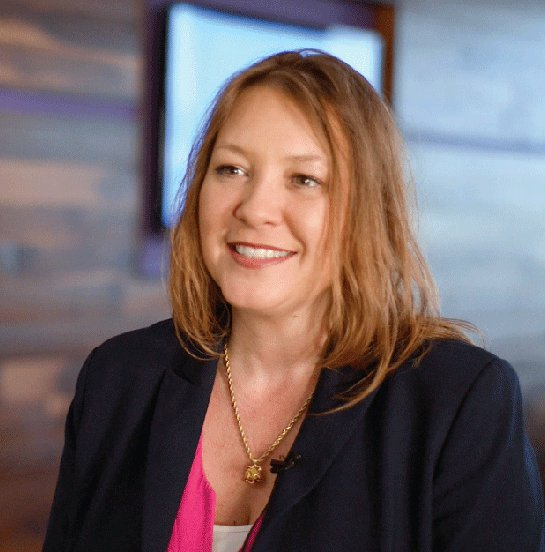 What factors will influence healthcare in 2019? B.E. 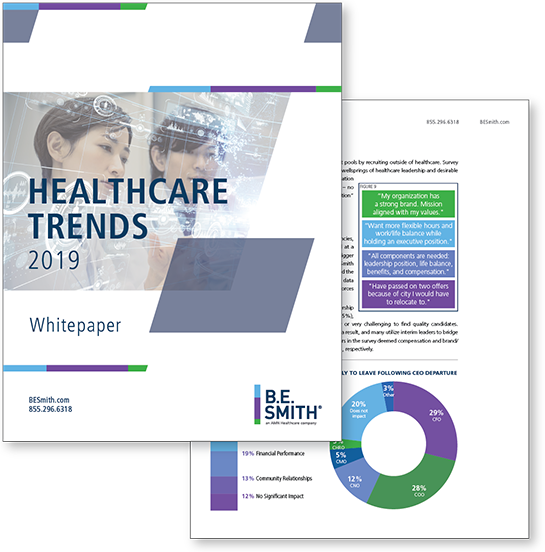 Smith's Healthcare Trends for 2019 whitepaper shares details and insights on 11 trends which will impact healthcare organizations. Discover what concerns are top of mind for leaders and learn about the workforce trends that are changing the healthcare landscape. Includes discussions on which leadership competencies will be the most important in the years ahead, the new influencers effecting the healthcare landscape, and why population health has become increasingly more important. B.E. 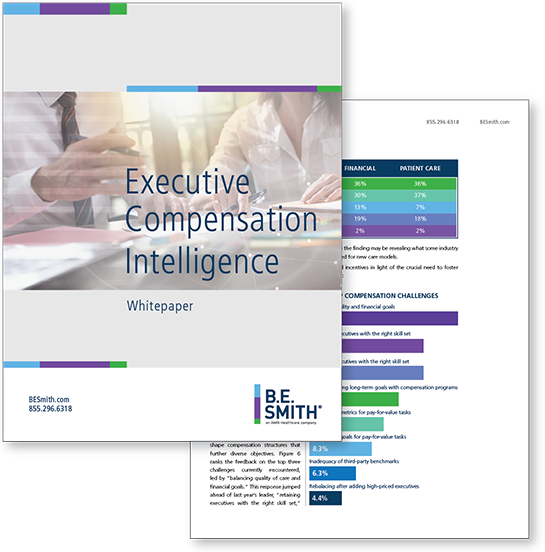 Smith’s Executive Compensation Intelligence Report Whitepaper summarizes key findings and delivers actionable insights regarding executive compensation trends, challenges, and strategies in the healthcare industry. The white paper explores the direct and indirect impact executive compensation has on the key initiatives of talent management, employee engagement, and organizational success. You'll learn about current total executive compensation levels, trends, and satisfaction levels, at-risk incentive compensation, top challenges, and more. B.E. 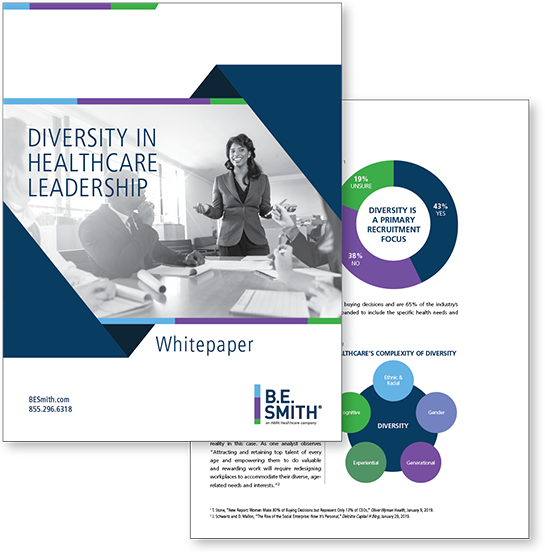 Smith’s Diversity in Healthcare Leadership Whitepaper discusses where the healthcare industry stands on diversity, including the five types of leadership diversity that demand attention in the healthcare sector. It will help readers understand existing barriers in diversity and explain why recruiting, leadership development and organizational developments are integral to success in today's changing healthcare landscape. To learn more about how diversity in healthcare leadership is evolving, simply click the link below.